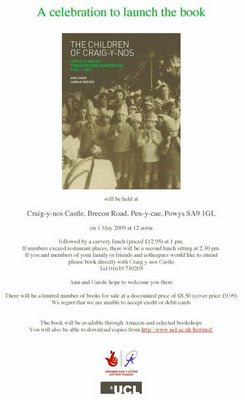 If you would like to attend the launch of "The Children of Craig-y-nos" on May 1st then ring up Craig-y-nos Castle direct and book in for the carvery lunch ( £12.95). The number is: 01639 730205. Over 150 invitations ( an example is featured here) have already been sent out. We regret that we are unable to accept creid or debit cards. You will also be able to download copies from http://www.ucl.ac.uk/histmed ( after May 1st).